From the race track to the road: the new BMW M8 Coupe (fuel consumption combined: 10.8 – 10.7 l/100 km [26.2 – 26.4 mpg imp]; CO2 emissions combined: 246 – 243 g/km*) is rounding the final corner en route to series production. BMW M GmbH is putting an early prototype of its upcoming flagship through its paces at the Estoril grand-prix racing circuit in Portugal. New BMW M8 (Fuel consumption combined: 10.8 – 10.7 l/100 km [26.2 – 26.4 mpg imp]; CO2 emissions combined: 246 – 243 g/km) in the final phase of the series production development process. Customary BMW M dynamic prowess, agility and precision enter a new dimension. M-specific optimisations further increase already high levels of rigidity in the body structure, chassis components and chassis mounting. M-specific suspension delivers exceptional directional stability, steering precision and cornering dynamics. High-revving V8 engine with M TwinPower Turbo technology produces north of 440 kW/600 hp. Fully variable transfer of power via M xDrive all-wheel-drive system with rear-wheel bias and 2WD mode. 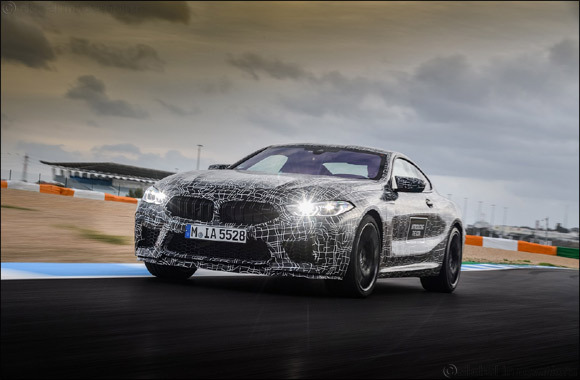 Market launch of the BMW M8 Coupe in the course of 2019. Further model variants: BMW M8 Convertible, BMW M8 Gran Coupe. Dubai, UAE, November 29, 2018: All figures relating to performance, fuel/electric power consumption and emissions are provisional. The fuel consumption, CO2 emissions and electric power consumption figures were determined according to the European Regulation (EC) 715/2007 in the version applicable. The figures refer to a vehicle with basic configuration in Germany. The range shown considers the different sizes of the selected wheels/tyres and the selected items of optional equipment, and may vary during configuration. The values are already based on the new WLTP test cycle and are translated back into NEDC-equivalent values in order to ensure comparability between the vehicles. With respect to these vehicles, for vehicle-related taxes or other duties based (at least inter alia) on CO2 emissions, the CO2 values may differ from the values stated here (depending on national legislation). Further information on official fuel consumption figures and specific CO2 emission values of new passenger cars is included in the following guideline: 'Leitfaden über den Kraftstoffverbrauch, die CO2-Emissionen und den Stromverbrauch neuer Personenkraftwagen' (Guide to the fuel economy, CO2 emissions and electric power consumption of new passenger cars), which can be obtained free of charge from all dealerships, from Deutsche Automobil Treuhand GmbH (DAT), Hellmuth-Hirth-Str. 1, 73760 Ostfildern-Scharnhausen. Fuel consumption combined: 10.8 – 10.7 l/100 km [26.2 – 26.4 mpg imp]; CO2 emissions combined: 246 – 243 g/km.